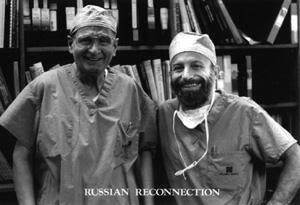 For Dr. Victor Krylov and Dr. Sherman Silber, East met West in a magazine article in 1984. In February, Dr. Krylov came to St. Louis, accompanied by his 15-year-old granddaughter, as Dr. Silber’s guest to studyin vitro fertilization and GIFT (Gamete Intrafallopian Transfer) techniques. During his three-week visit, he observed several GIFT procedures and a testicle transplant at St. Luke’s Hospital. Dr. Krylov will present the techniques to physicians in the U.S.S.R., where microsurgery is not organized within surgical specialities as it is in the United States, but in 36 centers devoted totally to microsurgery. “The St. Luke’s technique will go all over Russia,” Dr. Krylov said. “It’s certainly a very good hospital,” he said about St. Luke’s. Because the Soviet government provides medical care, microsurgical techniques were more important to Dr. Krylov than administrative procedures. “It’s not so much the quality of linen as it is the quality of surgery,” he said, grasping his surgical scrubs. Dr. Krylov has dedicated most of his current research to solving his country’s infertility problems, which closely parallel those in the West. The two microsurgeons conferred in detailed discussions about infertility. “It was a true non-bureaucratic collaboration,” Dr. Krylov said. For years, scientists thought sperm had to travel from the testicle through the epididymis to mature enough to fertilize the egg. But different standards, medical climates and government bureaucracies won’t hinder the doctors’ exchange of ideas. Although Dr. Krylov speaks fluent English, American slang words are not a part of his vocabulary. “In the operating room during surgery, a nurse said, “Gotcha,” Dr. Silber said. “So now he knows what ‘gotcha’ means.” Between these two men, medicine has broken all barriers.